Two sustainably-minded parents at Camdenville Public School – Lachlan Jobbins, Georgina Eldershaw and Lachlan’s son Jack came up with Food Scrap Friday. This composting initiative is a win-win idea encouraging their school community to recycle food waste to create compost for the Camdenville Paddock Community Garden. 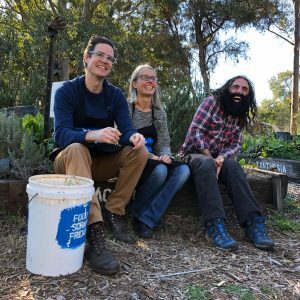 “We started talking about community composting among [Camdenville Garden] paddock members in 2015, but it was more than a year until we had the lightbulb moment – a single drop-off event at the school gates, one day a week,” says Lachlan, reminiscing about the beginnings of this project. The first day of Food Scrap Friday began on 21 October 2016 with 7kgs of food scraps being collected in one bucket (half of which is suspected to have come from Lachlan’s own household)! As of December 2018 they are at a grand total of 9186 kgs. The Food Scrap Friday team has also grown from Lachlan and Georgina to a roster of eight volunteers. “A big learning is that you can’t do something like this alone, and composting (like anything) is much more fun with friends!” added Lachlan. It’s great that the Food Scrap Friday team weighed the scraps every week and counted the number of contributions. Camdenville Paddock Community Garden facebook page shares this transparent process for community, school and everyone to easily see and be a part of this project. .
Food Scrap Friday is not only a regular weekly event on the Camdenville weekly school calendar, but has also expanded to collecting close to 50kgs of coffee grounds from local cafes every week to combine with garden waste and food scraps to make compost. What’s next for Food Scrap Friday? They would just love others to get inspired by their project with all its humble beginnings and offer support to others if they would like to apply this idea to their own community whether it be schools or day care centres. “We welcome visitors from other schools to come and see what we’re doing. We’d like Food Scrap Friday to be a model for other schools to use,” added Lachlan. 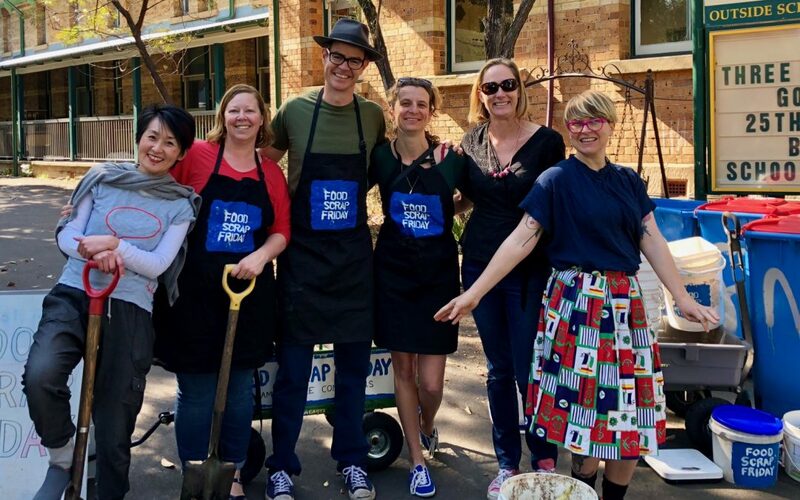 Food Scrap Friday is going strong, making waves in the community and even catching the interest of the Gardening Australia TV show and magazine. Their story will feature on ABC TV on 1 February 2019 at 7:30pm. Be sure to make a date with your couch to watch Food Scrap Friday’s story and then maybe even start thinking of how you can compost food waste at home or in your community. Founders Lachlan Jobbins and Georgina Eldershaw of Food Scrap Friday with Costa from Gardening Australia.